This post contains affiliate links that will allow me to receive a small commission at no extra cost to you. Do you have a crocheter to shop for this holiday season? 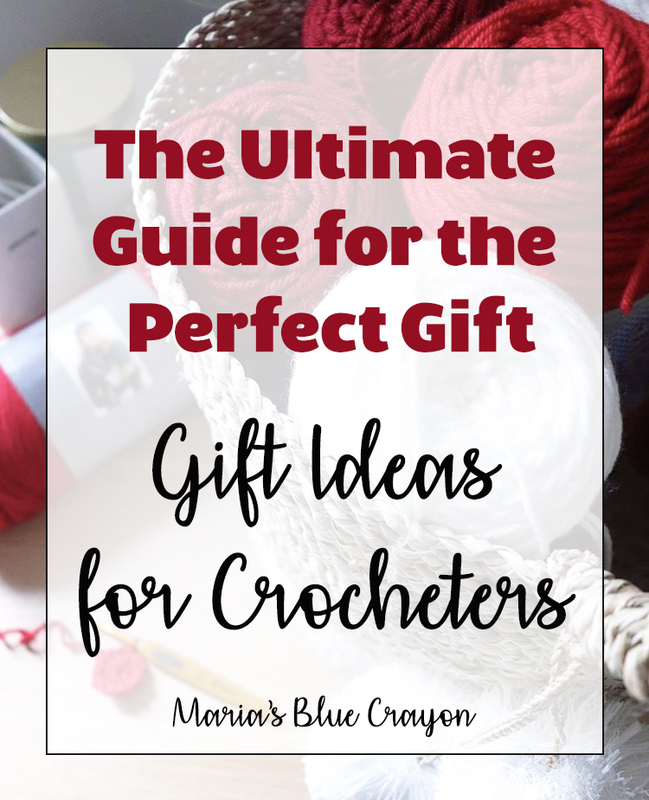 I put together a whole gift guide of what your crochet friend may love to receive as a gift! As an avid crocheter, I either have or would love all of these things in my stocking or as a gift! Browse through and see what your crochet friend would like as a gift. If you aren’t sure what kind of yarn your crochet lover will like, play it safe and buy a gift card. It may be extra special to find a local yarn store and if they offer gift cards there, buy one from them. Local yarn stores usually have specialty, more expensive yarns and fibers. Treat your crochet friend with the luxurious yarns they may not try otherwise! Typically all a crocheter needs is yarn and a crochet hook, but there are many other little tools and gadgets that are very helpful while crocheting! The following are great little tools that will take their crochet experience to the next level. The following hooks are known to be very comfortable to work with. Personally, I have the whole set of Clover Amour hooks and a few Furls Streamline hooks. Clover Amour are my go to and the Furls hooks allow me to crochet for long periods of time without hand cramps. There are many talented people out there who add beautiful designs with clay onto hooks! You can search far and wide for the perfect hook for your crochet friend. I searched “polymer clay crochet hook” and this is the one I found that I love! These small gadgets are extremely helpful to keep track of what row you are on especially on big projects. You can never have enough tape measurers! Trust me, I know. I can’t tell you how many have fell into my couch or have mysteriously disappeared. You can find cute ones on Etsy! This llama tape measure one is my favorite. This seller has a lot of other designs to offer as well. This one acts as a tape measure AND bracelet. It’s really cute too! For your crocheters on the go, this would be a great gift. Not every crocheter checks their gauge, but it may be important to when making sweaters and wearables. This guide is very handy and makes it easier for them to gauge! Typically 4″ is used for gauge swatch so I would go with the 4″. Yarn winders are necessary for some yarns depending how they are sold. They can also prove to be very helpful in keeping left over yarn organized and untangled! This yarn winter from Knit Picks is the cheaper option, but in my opinion works wonderfully. It does the job and I’m able to wind up my yarn with no issues. Stanwood yarn winders are the top notch brand if you want to spoil your crocheter. I have only heard good things about this yarn winder and your crocheter will be excited to try it out! Stitch markers can be used for keeping track of a stitch/row or to clip onto the yarn when the project is set down to ensure no unraveling will occur. When you pick out stitch markers for your loved one, be mindful that stitch markers are different for crochet and knit. For crocheters, you want to make sure the stitch marker has some sort of opening or clasp. These stitch markers have letters/hook sizes on them which is helpful in remembering what hook is used for the project. These stitch markers are just adorable! There are many different themes of stitch markers out there on Etsy, you just have to search. These little guys often get lost or misplaced so having extra always comes in handy! I especially like these Clover Bent Tip needles. Yarn bowls are great when you don’t want the yarn rolling around on the floor. It keeps all your yarn in one place while you’re working with it! You can usually find one at your local craft store or you can get fancy and find one on Etsy. I found this gorgeous wood one on Etsy. You can also find ceramic yarn bowls like this one. Scissors are a must! Cute, small scissors are even better because they are easy to store and well, they’re cute! These cuties are shaped like a sheep! These are portable pocket scissors. They have a little case so they won’t poke anything while in your pocket or bag. These gifts are fun to give to your favorite crocheter. I’m sure they will love at least one of these items! Your crocheter would probably appreciate a shirt that reflects their love of crochet. Yarn Mama’s have super comfortable tee shirts in various styles! I personally have one and I love it. Check out what they have to offer here. Does your crochet friend like to drink coffee or tee? These mugs may be the perfect thing for them! These are fun stickers that you crochet friend can relate to! Get a few so they can put it on their laptop/tumbler/car. These have become pretty popular lately. These cute little pins can be worn on sweaters/jackets or on project bags. Your friend needs a project bag for all of her projects. Trust me, I have about 5 and it’s still not enough! Here is a good size project back for on the go and for smaller projects. There are a number of different designs for this one. Here is a tote that you can get personalized! If you are getting a number of small tools for your crocheter, a pouch to put them all in would be perfect! I find that “pencil pouches” are what works best to ensure crochet hooks can fit into them. There are a ton of cute ones on Etsy! If your crochet friend makes a lot of gifts for others (or sells them!) These tags would be perfect for them to put on finished items. These specific tags can be personalized. These lights are fantastic! They are a bit on the pricier side, but you will be able to see EVERYTHING with this light. You can get different styles as well. You can find them here on Amazon, but you may also want to keep an eye out at your Joann or Michael’s for a sale or use a 50-60% off coupon when it’s regular price. There are a few yarn subscriptions out there. These are two that I have heard good things about. If your crocheter is also a gamer, this would be a fun little game for them! This game is only for Nintendo Wii.